So you fancy having a candy bar at your wedding? Beware! Candy bars make a great feature table, but if you have lot’s of children you’re sure to have sticky sweets left hanging around. Choose your type of sweets wisely, I would recommend marshmallows, smarties, pink flumps, red jelly lips and milk/cola bottles. We do love the swirly whirly lollipops, especially if your having a photo booth. They make a great pop to hide behind. You can make your own candy cones too to fit in with your theme. 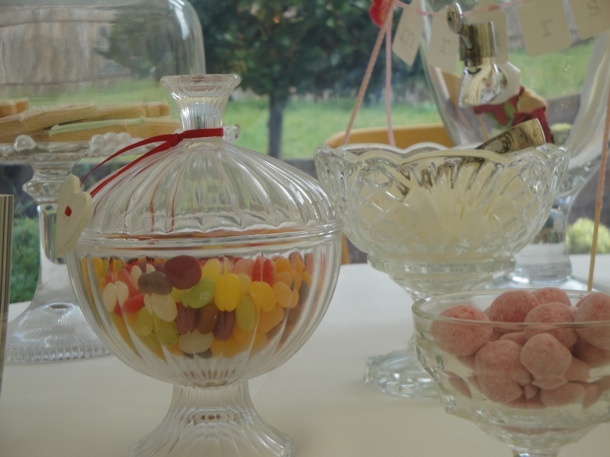 Displaying in vintage glass jars with big silver spoons, yum yum!